Hi Johnson was a well-known designer and manufacturer of model airplane engines in the middle of the last century. 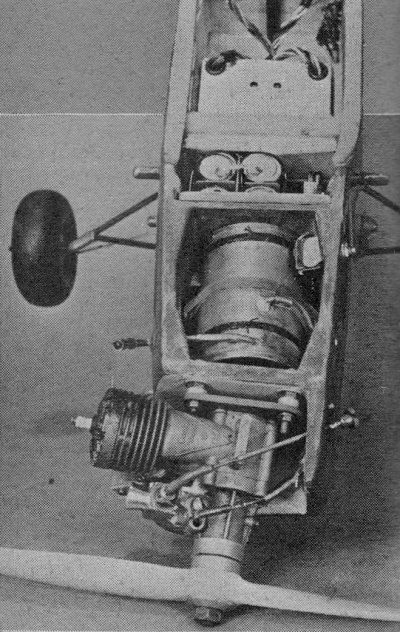 His series of throttled engines was widely used in the early years of radio control. A lot of research went into producing the enges to produce long lifetime, easy starting, and consistency of operation. The Johnson 35 R/C, which is the subject of this article, was one of the first to used dual ball bearings on the crankshaft, contributing mightly to the accomplishment of the aforementioned goals. 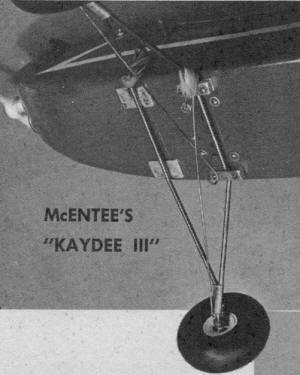 The state of the art for all types of model flying had advanced to where pilots could expect their models to last longer (not as many destructive crashes) so extending engine life was needed. Many powerplants in the .35 size look pretty much alike. And the Johnson J-R/C from outward appearance is not unlike other 35's. But mount it, flip the prop a couple of times and you find it's in a class by itself. This .35 is one of the smoothest, easiest starting, cleanest running engines tested, regardless of size. Not once during the entire running period was it necessary to prime the engine. Nor was it necessary to readjust the needle valve from its best setting of 1/4 turn open. Starts, hot or cold and exceptionally fast, required only a one flip choke, then one or two flips to catch. Cleanliness of operation, or more technically combustion efficiency, puts the J-R/C way up there. At about 3/4 throttle (9,500 rpm) 3 ounces of K&B Supersonic 100 fuel ran this engine for over 7 minutes. The J-R/C cannot be considered a quiet engine by any stretch of the imagination. Standing close to it, even in an open field, can put your head to ringing. This high noise factor may even be helpful to the R/C pilot who wants to hear that his engine is running smoothly at idling position. Much as we'd like to give an absolutely perfect report to a deserving product we did experience some difficulty with the needle valve supplied. When turned in to what should have been a fully closed position, our test engine was still able to draw fuel. In fact, with a pressurized fuel tank it could not break out of a rich running 4 cycle. It was therefore necessary that we conduct our test without using a pressurized fuel supply. We have since learned that this condition is not common to all J-R/C engines. We agree with Hi Johnson that numerous factors can affect carburetor performance, (temperature, fuel, humidity, altitude) and that it is nearly impossible to produce a single carburetor for all conditions. Available through local hobby shops is Part Number 1524 which consists of three differently tapered needles; one of which should give you optimum results. Without a pressure tank our test engine was very critical on tank position. A drop of only a few inches had serious effect on performance. Should this same condition be present in your J-R/C, get yourself a set of these needles and experiment until best results are obtained with a pressurized fuel system. Last issue, data and plans for Intermediate R/C winner. Herewith more pix. On aileron note lead balanced wire yoke. Battery pack slide shows charging socket at near corner. Angled double wire on stab is static balance. Tail wheel's under its pivot point. Internally, the J-R/C is fairly conventional, yet its designer has gone all out to insure long engine life. The use of instrument, precision ball bearings requires more care as to cleanliness but this is repaid by the extended life built into them. The steel cylinder is hardened by a special process that makes it tougher than hard chrome. Because of. its self-lubricating properties, Meehanite has come into prominence as a piston material in miniature engine manufacturer. 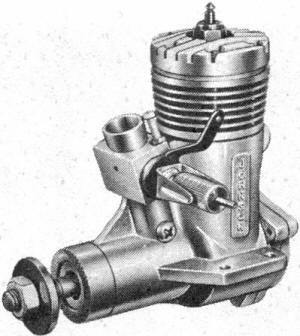 But to increase lubrication between cylinder and piston, Johnson hit upon a rather ingenious method. By using an extremely porous type of Swedish Scintered Meehanite the fuel and oil usually trapped inside the piston is forced through its walls to the cylinder barrel. To prevent a porous dome which would affect compression, both the inside and the outside of the dome is impregnated with a plastic composition which, when burned, forms a tough crust which completely seals it. Five hours of running time is required for the sealing process to take place. At the time of writing, life tests of these engines were still going on. We're informed that mills picked at random from the assembly line were still going after 304 hours continuous running . The cylinder barrel with its oversized intake port is a push-fit into a die-cast aluminum crankcase. A die cast aluminum head with machined cooling fins employs six Phillips head machine screws to hold it and the barrel securely to the crankcase. Gaskets prevent leaks. Johnson's one-piece crankshaft is heavily counterbalanced. It utilizes a hollow crankpin to further aid balancing. His rotary port is exceptionally large - almost 1/2" square. Two Fafnir ball bearings are employed. A large one, within the crankcase has 5/8" inside diameter contains 21 balls. The smaller is mor3 conventional with 1/4" inside diameter and 5 balls. Propeller drive is the friction type. An aluminum split tapered collar hugs the crankshaft and the tapered inside diameter of the aluminum drive washer when tightened by the prop nut grips this collar and squeezes it snugly to the shaft. No prop slippage was encountered during our test period. Connecting rod is forged aluminum. Wrist pin is steel and padless. Crankcase rear cover, die-cast aluminum, comes fitted with a removable pressure tap. If a pressure tank is not required, a machine screw (supplied) replaces the pressure tap fitting. The secret to the broad running speed range credited to the J-R/C is its AM-1 carburetor. This automatically provides a proportioned mixture of fuel and air throughout the entire speed spectrum. Found extremely reliable and simple to adjust even while the engine is running, its actuating arm may be rotated to any convenient position and then locked in place. Full travel of the arm, from high to low speed, is approximately 1 3/8". Performance tests were conducted as soon as the engine would run out a complete tank of fuel at full speed without slowing down or showing any sign of overheating. This required a little over 1 hour of 4 cycle running. With a Top Flite 11/6 our test engine hit 13,000 rpm and idled smoothly at 1,800 rpm. An 11/4 and a 10/6 registered the same high of 14,500 rpm and low of 2,000 rpm. With a 9/6 nylon prop speed jumped to just over 16,000 rpm as idling speed increased to 4,500 rpm. At the end of the test period, the engine was disassembled and inspected. No sign of wear was discernable. In fact, the piston had not completely seated itself. A rather crusty residue had begun to form on the piston dome but had not completely covered it. The underneath portion of the dome was only partially uncrusted. From this we conclude that when the dome becomes completely sealed full compression ratio is reached and higher power results. Specifications: Bore .770; Stroke .770; Disp. .358; Compression ratio, 10.8:1; Weight, 9-oz. Manufacturer: Dynamic Models, Inc., 13755 Saticoy St., Van Nuys, Calif.